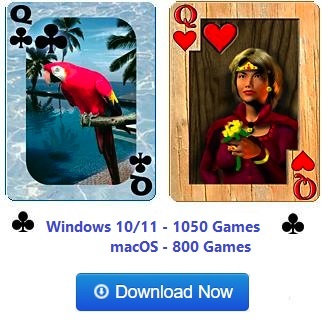 Screen shot of the game Inquisitor from Pretty Good Solitaire. Inquisitor is a two deck Klondike type game. It begins by dealing to ten tableau piles - one card to the first pile, two cards to the 2nd, and so on up to ten cards to the tenth pile. All cards are face up. The object is to build the eight foundation piles up in suit from the Aces to Kings. The tableau piles are built down by suit. 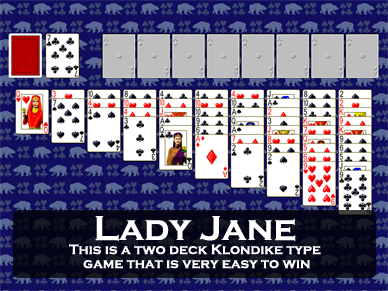 Groups of cards in sequence down by suit may be moved as a unit. Spaces in the tableau may be filled with any card or group of cards. The remaining cards are dealt to a stock pile, which will be turned over three cards at a time to a waste pile. There are two redeals. 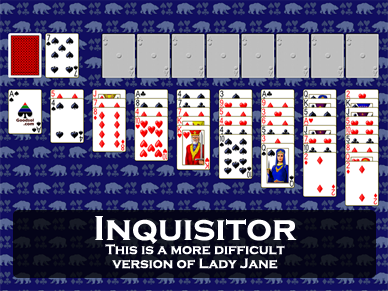 Inquisitor is a more difficult variation of the game Lady Jane. It also has a variation of its own called Quizzie. 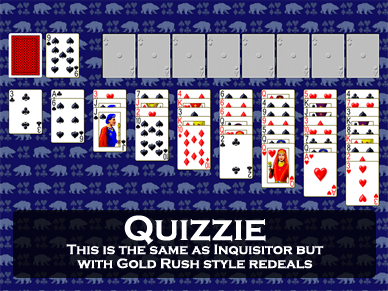 Quizzie is just like Inquisitor, except there is one less tableau pile (nine instead of ten), and instead of dealing three cards at a time from the stock, the stock deals three cards the first time through the stock, two cards after the first redeal, then only one card after the final redeal (similar to the game Gold Rush). 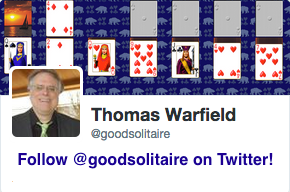 Inquisitor was invented by Thomas Warfield.